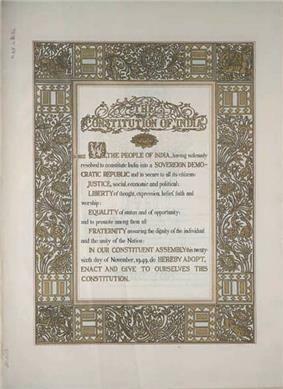 The Constitution of India is the longest written constitution for a country, containing 444 articles, 12 schedules, 94 amendments and 117,369 words. Law of India refers to the system of law in modern India. India maintains a common law legal system inherited from the colonial era and various legislations first introduced by the British are still in effect in modified forms today. During the drafting of the Indian Constitution, Indian laws also adhere to the United Nations guidelines on human rights law and the environmental law. Certain international trade laws, such as those on intellectual property, are also enforced in India. Indian family law is fairly complex, with each religion adhering to its own specific laws. In most states, registering of marriages and divorces is not compulsory. Separate laws govern Hindus, Muslims, Christians, Sikhs, and followers of other religions. The exception to this rule is in the state of Goa, where a uniform civil code is in place, in which all religions have a common law regarding marriages, divorces, and adoption. As of May 2010, there were about 1221 laws. However, since there are Central laws as well as State laws, it is difficult to ascertain their exact numbers as on a given date and the best way to find the Central Laws in India is from the official website. Ancient India represented a distinct tradition of law, and had a historically independent school of legal theory and practice. The Arthashastra, dating from 400 BC and the Manusmriti, from 100 AD, were influential treatises in India, texts that were considered authoritative legal guidance. Manu's central philosophy was tolerance and pluralism, and was cited across Southeast Asia. Early in this period, which culminated in the creation of the Gupta Empire, relations with ancient Greece and Rome were not infrequent. The appearance of similar fundamental institutions of international law in various parts of the world show that they are inherent in international society, irrespective of culture and tradition. Inter-State relations in the pre-Islamic period resulted in clear-cut rules of warfare of a high humanitarian standard, in rules of neutrality, of treaty law, of customary law embodied in religious charters, in exchange of embassies of a temporary or semipermanent character. With the advent of the British Raj, there was a break in tradition, and Hindu and Islamic law were abolished in favour of British common law. As a result, the present judicial system of the country derives largely from the British system and has few, if any, connections to Indian legal institutions of the pre-British era. The Constitution of India, which came into effect on the 26th of January, 1950 is the lengthiest written constitution in the world . Although its administrative provisions are to a large extent based on the Government of India Act 1935, it also contains various other provisions that were drawn from other constitutions in the world at the time of its creation. It provides details of the administration of both the Union and the States, and codifies the relations between the Federal Government and the State Governments. Also incorporated into the text are a chapter on the fundamental rights of citizens, as well as a chapter on directive principles of state policy. The constitution prescribes a federal structure of government, with a clearly defined separation of legislative and executive powers between the Federation and the States. Each State Government has the freedom to draft it own laws on subjects classified as state subjects 1. Laws passed by the Parliament of India and other pre-existing central laws on subjects classified as central subjects are binding on all citizens. However, the Constitution also has certain unitary features, such as vesting power of amendment solely in the Federal Government, the absence of dual citizenship, and the overriding authority assumed by the Federal Government in times of emergency. The Indian Penal Code formulated by the British during the British Raj in 1860, forms the backbone of criminal law in India. The Code of Criminal Procedure, 1973 governs the procedural aspects of the criminal law. Jury trials were abolished by the government in 1960 on the grounds they would be susceptible to media and public influence. This decision was based on an 8-1 acquittal of Kawas Nanavati in K. M. Nanavati vs. State of Maharashtra, which was overturned by higher courts. In February 2011, the Supreme Court of India ruled that criminal defendants have a constitutional right to counsel. Capital punishment in India is legal. The last execution was conducted in February 2013, when the mastermind of 2001 Indian Parliament Attack, Afzal Guru was hanged in Tihar Jail, New Delhi. The main contract law in India is codified in the Indian Contract Act, which came into effect on 1 September 1872 and extends to all India except the state of Jammu and Kashmir. It governs entrance into contract, and effects of breach of contract. Indian Contract law is popularly known as mercantile law of India. Originally Indian Sales of Goods Act and Partnership Act were part of Indian Contract act, but due to needed amendment these acts were separated from Contract Act. The Contract act is the main and most used act of legal agreements in India. Indian labour law are among the most comprehensive in the world. They have been criticised by the World Bank, primarily the grounds of the inflexibility that results from government needing to approve dismissals. In practice, there is a large informal sector of workers, between 80 or 90 per cent of the labour force, to whom labour rights are not actually available and laws are not enforced. The current Indian company law was updated and recodified in the Companies Act 2013. The development of constitutional tort law in India began in the early 1980s. It influenced the direction tort law in India took during the 1990s. In recognising state liability, constitutional tort deviates from established norms in tort law. This covers custodial deaths, police atrocities, encounter killings, illegal detention and disappearances. Law commission of India's first report was relating to the Liability of the State in Tort. This report was submitted by the Law commission of India on 11.5.1956. State owes tortious Liability under Article 300 of Indian Constitution. Indian tax law involves several different taxes levied by different governments. Income Tax is levied by the Central Government under the Income Tax Act 1961. Customs and excise duties are also levied by the Central government. Sales tax is levied under VAT legislation at the state level. The Central Board of Direct Taxes (CBDT) is a part of the Department of Revenue in the Ministry of Finance, Government of India. The CBDT provides essential inputs for policy and planning of direct taxes in India and is also responsible for administration of the direct tax laws through Income Tax Department. The CBDT is a statutory authority functioning under the Central Board of Revenue Act, 1963.It is India’s official FATF unit.The Central Board of Revenue as the Department apex body charged with the administration of taxes came into existence as a result of the Central Board of Revenue Act, 1924. Initially the Board was in charge of both direct and indirect taxes. However, when the administration of taxes became too unwieldy for one Board to handle, the Board was split up into two, namely the Central Board of Direct Taxes and Central Board of Excise and Customs with effect from 1.1.1964. This bifurcation was brought about by constitution of the two Boards u/s 3 of the Central Boards of Revenue Act, 1963. However, this Act may soon be repealed and be replaced with a new Act consolidating the law relating to Income Tax and Wealth Tax, the new proposed legislation is called the Direct Taxes Code (to become the Direct Taxes Code, Act 2010). Act was referred to Parliamentary standing committee which has submitted its recommendations. Act is expected to be implemented with changes from the Financial Year 2013-14. Service tax is a part of Central Excise in India. It is a tax levied on services provided in India, except in the State of Jammu and Kashmir. The responsibility of collecting the tax lies with the Central Board of Excise and Customs(CBEC). The ex-Finance Minister of India, Pranab Mukherjee (now the President) in his Budget speech has indicated the government's intent of merging all taxes like Service Tax, Excise and VAT into a common Goods and Service Tax by the year 2011. To achieve this objective, the rate of Central Excise and Service Tax will be progressively altered and brought to a common rate. In budget presented for 2008-2009 It was announced that all Small service providers whose turnover does not exceed 1,000,000 need not pay service tax. Trust law in India is mainly codified in the Indian Trusts Act of 1882, which came into force on March 1, 1882. It extends to the whole of India except for the state of Jammu and Kashmir and Andaman and Nicobar Islands. Indian law follows principles of English law in most areas of law, but the law of trusts is a notable exception. Indian law does not recognise "double ownership", and a beneficiary of trust property is not the equitable owner of the property in Indian law. Family laws in India are different when Warren Hastings in 1772 created provisions prescribing Hindu law for Hindus and Islamic law for Muslims, for litigation relating to personal matters. However, after independence, efforts have been made to modernise various aspects of personal law and bring about uniformity among various religions. Recent reform has affected custody and guardianship laws, adoption laws, succession law, and laws concerning domestic violence and child marriage. As far as Hindus are concerned Hindu Law is a specific branch of law. Though the attempt made by the first parliament after independence did not succeed in bringing forth a Hindu Code comprising the entire field of Hindu family law, laws could be enacted touching upon all major areas that affect family life among Hindus in India. Jains, Sikhs and Buddhists are also covered by Hindu law. For Christians, a distinct branch of law known as Christian Law, mostly based on specific statutes, applies. Christian law of Succession and Divorce in India have undergone changes in recent years. The Indian Divorce (Amendment) Act of 2001 has brought in considerable changes in the grounds available for divorce. By now Christian law in India has emerged as a separate branch of law. It covers the entire spectrum of family law so far as it concerns Christians in India. Christian law, to a great extent is based on English law but there are laws that originated on the strength of customary practices and precedents. Christian family law has now distinct sub branches like laws on marriage, divorce,restitution, judicial separation, succession, adoption, guardianship, maintenance, custody of minor children and relevance of canon law and all that regulates familial relationship. Nationality law or citizenship law is mainly codified in the constitution of India and the Citizenship Act of 1955. Although the Constitution of India bars multiple citizenship, the Parliament of India passed on 7 January 2004, a law creating a new form of very limited dual nationality called Overseas Citizenship of India. Overseas citizens of India have no form of political rights or participation in the government, however, and there are no plans to issue to overseas citizens any form of Indian passport. Law enforcement in India is undertaken by numerous law enforcement agencies. Like many federal structures, the nature of the Constitution of India mandates law and order as a subject of the state, therefore the bulk of the policing lies with the respective states and territories of India. At the federal level, the many agencies are part of the Union Ministry of Home Affairs, and support the states in their duties. Larger cities also operate metropolitan police forces, under respective state governments. All senior police officers in the state police forces, as well as those in the federal agencies, are members of the Indian Police Service (IPS) and Indian Revenue Service (IRS), two of the several kinds of civil services. The federal police are controlled by the central Indian Police Service (IPS) officers are recruited by the Union Public Service Commission through a competitive nationwide examination. On completion of a nationwide basic public-service course, the Indian Police Service recruits attend the National Police Academy at Hyderabad, Andhra Pradesh, for training. They are then assigned to particular state or union territory forces, where they usually remain for the rest of their careers. About 50 percent of the officers are regularly assigned to states or territories other than their own in an effort to promote national integration. ^ Alexander, C.H. (July 1952). "International Law in India". The International and Comparative Law Quarterly 1 (3): 289–300. ^ Dwyer Arce (February 28, 2011). "India Supreme Court finds constitutional right to counsel". JURIST - Paper Chase. ^ "India Country Overview 2008". World Bank. 2008. ^ "World Bank criticizes India's labor laws". ^ a b c Dr. Usha Ramachandran. "Tort Law in India" (PDF). ^ "Economic growth boosts India’s tax collection". ^ "Direct Taxes Code Bill: Government keen on early enactment". The Times Of India. 2012-03-16. Basu, Durga Das (2007). Commentary on the Constitution of India (8th ed.). Nagpur: Wadhwa & Co.
Glenn, H. Patrick (2000). Legal Traditions of the World. Oxford University Press. Jain, M.P. (2006). Outlines of Indian Legal and Constitutional History (6th ed.). Nagpur: Wadhwa & Co.